A week after ABC anchor Dan Harris hailed how "Senator Ted Kennedy is using his own battle against brain cancer to make an emotional pitch for health care reform. Writing in Newsweek, Kennedy called it 'the cause of my life,'" Sunday's World News devoted a full story to Kennedy's cause as Harris' tease framed Kennedy's big government agenda in the most-benign light: "In the game. 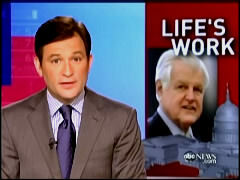 An ailing Ted Kennedy, now working from his sick bed to achieve his life-long goal of health care for everyone." He introduced the subsequent story: "Behind the scenes, Senator Ted Kennedy, a man who has called this his life's work, is playing a surprisingly large role, despite his brain tumor." Reporter John Hendren fretted: "Senator Edward Kennedy is the missing man in the battle for health care reform. On Capitol Hill, nearly everyone agrees things would be different if the liberal lion were here." Hendren went back to March to show a clip of President Obama saluting Kennedy - "To Sir Edward Kennedy. That's the kind of greeting a knight deserves. It is thrilling to see you here, Teddy" - before effusing over how "in his absence, his colleagues invoke his name, hoping also to borrow his legislative prowess." Nonetheless, Hendren concluded, passing Obama's health agenda has been "made harder by the absence of its top advocate on Capitol Hill." As if that's a bad thing. DAN HARRIS: In Washington today a key Democrat conceded that they will need Republican help to push President Obama's health care overhaul plan through the United States Senate. Right now, that bill is stalled. Behind the scenes, Senator Ted Kennedy, a man who has called this his life's work, is playing a surprisingly large role, despite his brain tumor. Here's John Hendren. JOHN HENDREN: Senator Edward Kennedy is the missing man in the battle for health care reform. On Capitol Hill, nearly everyone agrees things would be different if the liberal lion were here. SENATOR ORRIN HATCH: He's the only person I know that can corral them and get them to do what's right. He's willing to come to the center. He's willing to make it a true bi-partisan bill. HENDREN: As he stays home in Massachusetts for treatment of a brain tumor, and an occasional sail, colleagues say Kennedy is closely monitoring the health care debate on C-SPAN and e-mail. But his influence is said to be limited by his increasing difficulty communicating. Today, the health care reform he calls "the cause of my life," is stalled. And with some Democrats wavering in their support, the Senate is nearly certain to miss President Obama's deadline of passing it by August. SENATOR KENT CONRAD, ON ABC'S THIS WEEK: Look, there are not the votes for Democrats to do this just on our side of the aisle. HENDREN: On Kennedy's rare returns to Washington, even the President takes notice. PRESIDENT BARACK OBAMA, MARCH 5: To sir Edward Kennedy. That's the kind of greeting a knight deserves. It is thrilling to see you here, Teddy. HENDREN: In his absence, his colleagues invoke his name, hoping also to borrow his legislative prowess. SENATOR CHRIS DODD, ON SENATE FLOR: Senator Ted Kennedy, who is wrestling with his own health care crisis at this hour and has been unable to be with us. SENATOR JACK REED, ON SENATE FLOOR: Senator Kennedy's presences was palpable. HENDREN: When health care reform comes to a vote, friends say, if Kennedy has the strength, nothing will stop him from returning to the Capitol. HATCH: If they can get a bill put together, he'd be one of those who would want to be there. HENDREN: Kennedy has come back to vote several times since his diagnosis. But it's been three months since the last return of the Senator from Massachusetts. The President has set a new deadline. He now want to have health care reform on his desk so he can sign it into law by the end of the year. But that's still a job made harder by the absence of its top advocate on Capitol Hill. Dan? HARRIS: John Hendren on Capitol Hill tonight.